Our family has been trying to reduce our sugar and salt intake, and also buy fewer processed foods. I’d like to say that this saves us money, but that hasn’t been the case…so far. However, in the long run, if our medical bills in the future remain low, then we will have saved money and will have preserved our health instead of just buying the cheapest, easiest "foods" for our meals and snacks. If you come to my home and browse through my cupboards, you’ll still see that we are in this transition process. But…there are far fewer boxed/packaged/jarred/canned goods in my cupboard! We’re also trying to use more whole wheat flour and whole wheat pastry flour. I’ve been grinding wheat berries in a $30 Cuisinart coffee burr mill to make flour because I can’t really afford to buy a $400+ grain mill right now. It doesn’t grind as finely as purchased flour, but it is working for us so far. We’re using coconut oil, red palm oil, and butter for our fats. While it does mean that we need to adapt or throw out some of our old recipes, it also means we get to try some new recipes as well! 1. In a 9×12" baking pan, combine the oats, sesame seeds, nuts, and salt. Toast in the oven at 350 degrees for 12 minutes or until light golden. ***Stir every 4 minutes or so to prevent burning. 5. Take sweet sauce away from the heat and stir in the vanilla. Pour fruit/sauce directly over the toasted mixture. Stir until well combined. Press mixture into the pan with the back of a spoon. 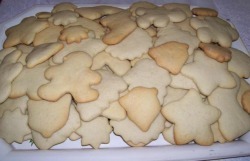 Maple Leaf Cookies - YUMMMM! We have a new family favorite at our home….Maple Leaf Cookies! These made such a moist, faintly sweet cookie that was so delicious, and the cookies seemed to improve with age, instead of becoming dry and stale after a day or two like most homemade cookies. You will need to use real Grade B maple syrup for these cookies, though, because if you choose to use maple flavoring (1 tsp. or so), the maple flavor will hardly be evident. I recommend sticking with the real maple syrup! We tried this recipe again recently with regular maple syrup from the store, and they had very little maple syrup flavor. Huh? What’s with that? Well, I went back and looked at the new bottle of maple syrup, and it was Grade A. Normally, with the way that foods are graded, you’d think this would be better than Grade B, but this isn’t the case. For true, richer maple syrup flavor in these cookies, please make certain that your maple syrup is Grade B! If the thought of cutting out cookies with a cookie cutter seems too time consuming for you, you may also roll out the dough and cut it into squares or rectangles and then bake the cookies without using cookie cutters. Measure all ingredients into a large bowl. If using large stand mixer, beat ingredients on low speed until well combined, or beat by hand. Shape dough into ball; wrap with plastic wrap. Refrigerate dough 1 hour or until easy to handle. Set oven racks to upper-middle and lower-middle positions. Preheat oven to 350 degrees. Grease 2 large cookie pans, or lightly spray pans with cooking spray and then place parchment paper onto pans. On a lightly floured surface, roll small portions of the dough out at a time to about 1/4" thickness. With a cookie cutter (if desired), cut dough out and place cookies one inch apart on greased or parchment-lined cookie pans. Or, cut dough into squares or rectangles and place onto pan to bake. Bake cookies for 5 minutes; switch and rotate pans and bake an additional 5 minutes or until golden. Carefully remove cookies to wire racks to cool. Repeat until all dough is used, greasing cookie sheet each time (if not using parchment paper).